A few weeks ago the girls and I picked up some seeds to try our hand at some container gardening in the backyard this summer. I realized I wanted to do them in seed starters so I picked up a container of them this weekend. 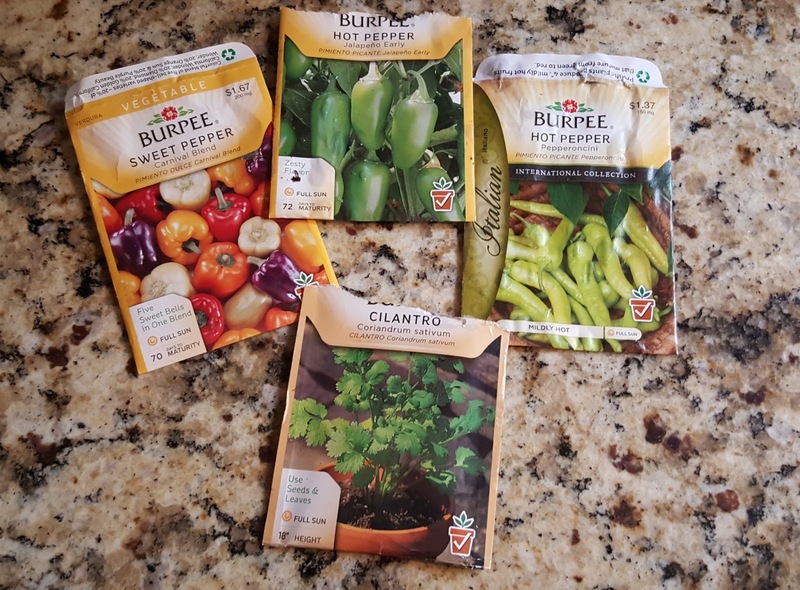 This is the seed starter kit I bought but it is cheaper at Home Depot. I planted all 25 spots. It was fairly simple to do. You pour in about 5 cups of warm water across the tops of each peat pellet and wait for them to plump up. Once they have risen, you pull back the netting a bit and put 2-3 seeds in each peat round. 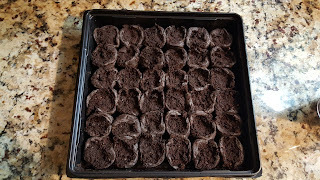 You cover the tops of the seeds with the extra peat and cover them with the lid. They are supposed to sit in a warm place until they sprout. I have never tried this method so am hopeful it will work better than my past gardening attempts on vegetables. Our family obviously has a real pepper problem -- Sweet Peppers (me), Jalapeno Peppers (Josh, me), Pepperocinis (Tori, me). Actually now that I typed that out, I realize it is me with the pepper problem! We also bought some Cilantro because I really love cilantro especially in my salsa. With these kinds of ingredients, I guess we should try to do a tomato plant too. I worry about my naughty dogs getting into them, especially Molly who will eat absolutely anything! But I may try anyway.